Think Burrus Blog: Who Would Have Thunk that a Cover Crop Stunk? Recently, there has been buzz on my Facebook page about a really bad odor along Route 16 in my home county. One of my friends who is a teacher, knew my occupation, and reached out to me for help because she recently encountered an awful smell, while traveling to and from work. It's hard enough to be an elementary teacher, but add an awful stench to her commute, and this was a bad day (as Tom Burrus would say)! She described the smell as a "dead, rotting carcass, with a poopy, diaper smell", and yes she has small children. She had heard that a farmer had "dying radishes" in a large field and it was rumored that this was where the smell originated. Another Facebook friend, who is a local volunteer fireman chimed in, and said that Ameren and local police had been called and were "running around like chickens with their heads cut off" looking for a gas leak. They were finally notified that the smell was not natural gas, but "radishes." Even though some of my friends are still "not convinced there isn't a dead body in the field," we finally came to the conclusion that the smell was due to a cover crop or tillage radishes. Other reports of smelly cover crops came in from Burrus dealers, Brian and Kyra Willenborg near Vandalia, Illinois as well as Kyle Kiefer, who said that 40 acres of tillage radishes caused the entire town of Ina, Illinois to "smell like sauerkraut." Why would a farmer plant such a stinky crop? Cover Crops have grown in popularity over the last several years. They provide many benefits such as adding nutrients to the soil, preventing removal of nutrients, such as nitrates, which can lead to detrimental effects in the Gulf of Mexico, improve soil tilth, prevent soil erosion (much needed this year), and assist with weed control or reduce the use of herbicides. So, let's cut to the chase. Why the smell? Kris Reynolds, Resource Conservationist at the Montgomery County Soil and Water District stated, "The weather this fall provided an abnormally, good growing season for cover crops, especially the radishes. The radishes were planted early and grew very well. The bigger the radish the worse the smell!" As freezing and thawing occurs, the radish is breaking down in the soil and this is accompanied by an odor. Matt Boucher said that the smell will be worse if tillage radishes are "very thickly planted in the field, without the presence of another cover crop species with it." David Rahe suggested that next time they might consider planting another cereal cover crop species, like oats to "thin out" the tillage radishes. Unfortunately, the smell could persist anywhere from a few days to several weeks. The moral of the story, is that by planting cover crops, farmers are not trying to "gas everyone out" so to speak, but be good stewards of the land for our future! 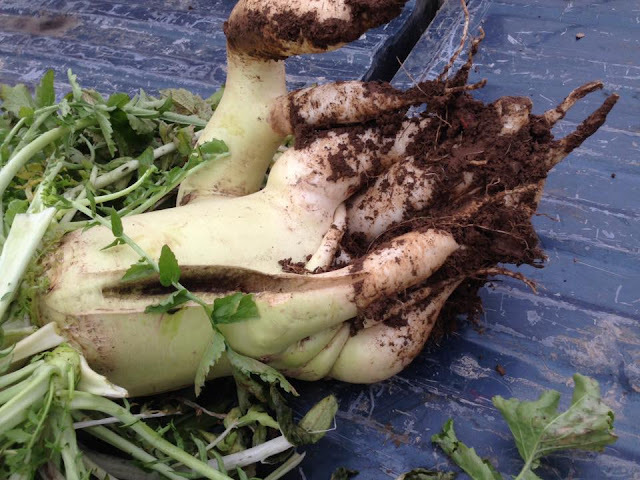 Picture of a "gigantic and stinky" tillage radish planted July 20th that was grown on the farm of Burrus Dealers, Kyra and Brian Willenborg, near Vandalia, IL.